We take immense pride in providing our clients with the cleanest water, at highest volume and lowest cost. No other drilling company knows underground Central Oregon the way we do! We will be glad to come look at your property and give you a free estimate. We will research the water wells that have been drilled near you so that we can give you a very close estimate as to what depth you can expect to find the best water at the highest volume. Our family has been drilling in Central Oregon for almost 100 years, taking pride in bringing quality, clean water to its residents. For nearly 30 years we have focused exclusively on the LaPine/Sunriver area, going as far south as Crescent. Our years of water well drilling in Central Oregon have resulted in an experienced-based knowledge of how best to drill in geological formations of this region. 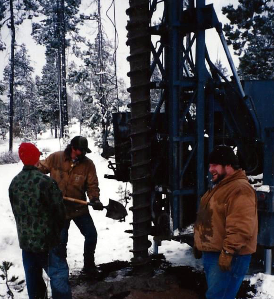 We drill with augers in the sandy areas and have developed a unique and highly successful gravel pack and well screen technique that increases water flow by approximately 30%, and significantly reduces sand pumping in the La Pine area where sand is frequently an issue. In rock formations we drill water wells with a cable tool rig. Though the process can be somewhat slower, it is advantageous in that it frequently allows water to be found at a shallower depth. The speed of a rotary rig can often drill through an aquifer, necessitating drilling to a deeper depth for water. Mathers Drilling Company works closely with Palmer’s Pumps who installs our pumps. 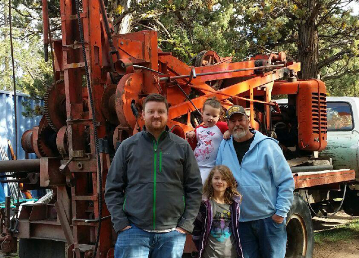 They, too, are a multigenerational, family-owned business that has been servicing La Pine/Sunriver since 1976.